Following up on the delicious fun we’ve had brewing and sharing Requiem for a Pancake, One Love – Imperial Stout Aged in Jamaican Rum Barrels, Rye on Rye on Rye on Rye, Allegro Non Troppo, Paw Paw’s Got a Brand New Bag and Messenger in a Bottle, our previous Brewhouse One Series releases, we’re excited to announce that it’s almost time to share another new, special beer with you, our friends and neighbors! 100 pounds of pecans were added during mashing with cinnamon, brown and dark sugars added during the boil. 50 pounds each of raw and toasted coconut, 30 pounds of roasted pecans, 25 pounds each of cacao nibs from Ecuador and Ghana and vanilla beans were added following fermentation. 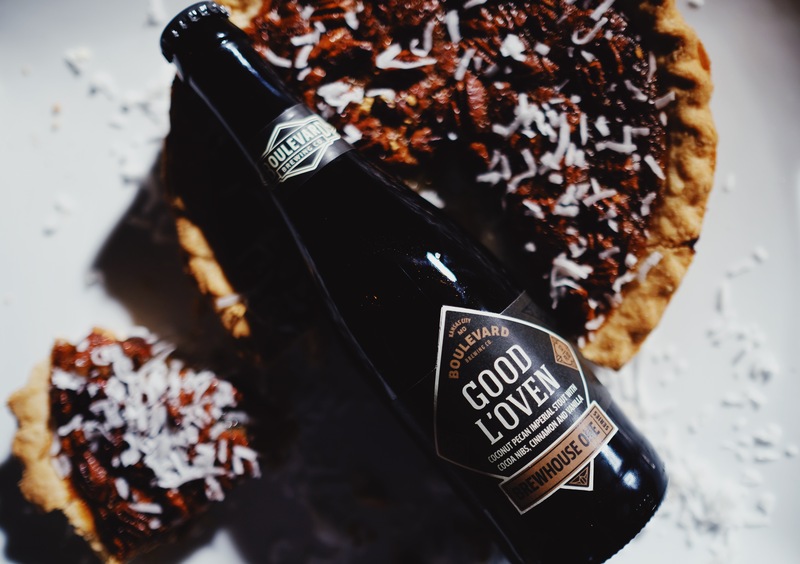 12oz bottles of Good L’Oven will be available exclusively in the Boulevard Tours & Rec Center Gift Shop beginning at 10am on Sunday, February 10th. Individual bottles will be $12 with four-packs of 12oz bottles available for $40. Limit: two four-packs per person, per transaction. Draft pours will also be available in our Beer Hall for $5 for 5oz. Thelma’s Kitchen, our charitable partner for this Brewhouse One Series release, will receive $1 from every 12oz bottle sold ($4 from every four-pack!) to benefit the work they do. Thelma’s Kitchen is Kansas City’s first donate-what-you-can cafe, located at 31st and Troost. A social venture and outreach initiative of Reconciliation Services, their mission is to cultivate a community seeking reconciliation to transform Troost from a dividing line to a gathering place, revealing the strength of all. Thelma’s Kitchen exists to meet very real needs of their neighbors for affordable food access and to gather people together for vibrant community life. At the core of their work is the belief that when we serve together and sit and share a meal together, we begin to understand what it means to be community. Thelma’s Kitchen is a gathering place, where everyone is welcome.